If you have dental problems, it is likely that you are familiar with different types of dental implants. But have you heard of ‘All-on-4 dental implants’? The name itself sounds weird, right? Well, the concept is not. The number of adult Americans losing all their upper and/or lower teeth every year has already crossed 35 million and it is increasing further. Most of them opt for standard dental implants as they are pretty common and widely popular. While this one is a good choice to cover the space left by a missing tooth, you may not find yourself comfortable with it when you are missing many of your natural teeth. Here come the advantages of All-on-4 dental implants. Feeling intrigued? Let us explore. The evolution of the basic ‘All-on-4’ concept made it a highly potent alternative to traditional implants and it was first identified (a registered trademark) by the well-known implant manufacturer ‘Nobel Biocare’. The traditional technique revolves around the insertion of a small titanium screw into the jawbone for replacement of the root-part of a missing tooth followed by the attachment of a ‘crown’ (fake tooth) to it. However, this is an individualistic approach in which one implant is necessary for every single missing tooth. But the use of advanced technology and materials in All-on-4 helps in restoring the full smile in an easy and effective way just by placing 4 implants strategically. They not only work as a strong, long-lasting foundation for your replaced teeth but also give you a youthful facial structure with an absolutely realistic appearance. The implants positioned in the front part of the jaw having the higher bone density for providing support to a fixed dental prosthesis with at least 12 teeth. As few as 4 titanium implants are needed for each jaw. Based on the requirements of the patients, they can be used for replacing either the top set of teeth or the bottom set of teeth or even both sets of teeth. The posterior implants are tilted 30-45 degrees from the biting plane in order to avoid anatomical structures like sinus cavities (upper jaw) and the nerve canal (lower jaw). 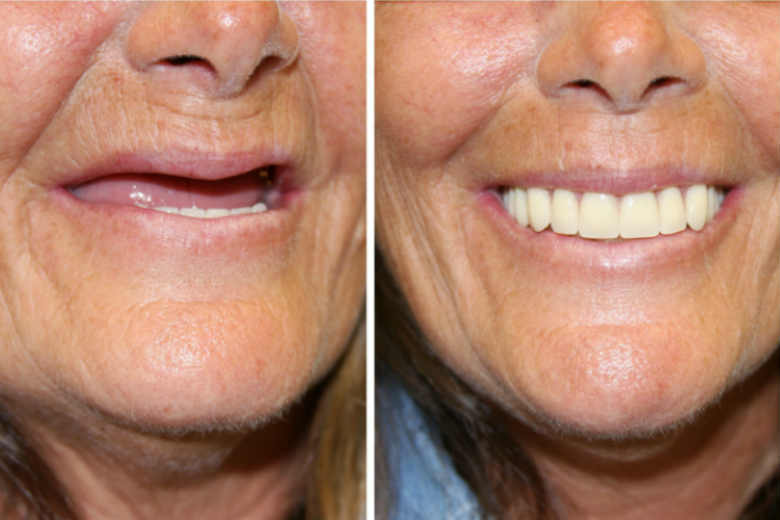 This also provides optimal strength to the prosthesis in patients with a bone loss by overcoming the need for expensive and time-consuming bone grafting. The All-on-4 treatment is perfect for anybody who has lost the majority of his/her natural teeth. It is also suitable for people suffering from medical conditions like diabetes, osteoporosis, etc. and hence, cannot undergo bone grafting due to low bone volume. 1. It all starts with the initial consultation with an expert dentist, who evaluates your jaw bone structure and density through a CBCT scan. If you are a suitable candidate for implants, the right treatment is planned and the new dental bridge is designed for you by taking your dental impressions and X-rays. 2. On the scheduled day of surgical implantation, you will be sedated by administering local or general anesthesia and your mouth will be prepared for the implants. This basically involves the extraction of the rest of the failing teeth as well as the removal of infected and damaged tissue from the gums and jaws. 3. Your mouth will be cleaned thoroughly prior to beginning the implantation process. 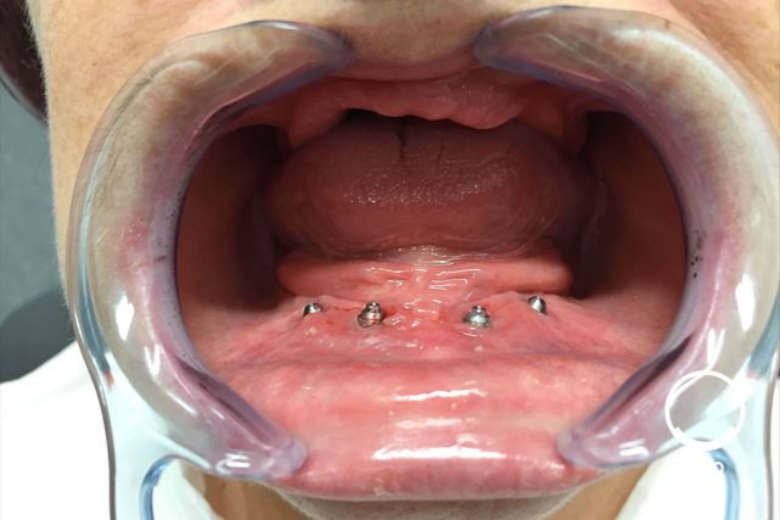 Then, your dentist will drill 4 holes in your jaws (two at the front and one angulated at each side of the back) and insert the titanium screws into the jawbone. 4. Once the implants are secured properly, your mouth will be cleaned once again focusing on the surgical sites. The dentist will also suture all the incisions made throughout the procedure with dissolvable stitches. 5. The new teeth are fitted and adjusted either the same day or the next day. 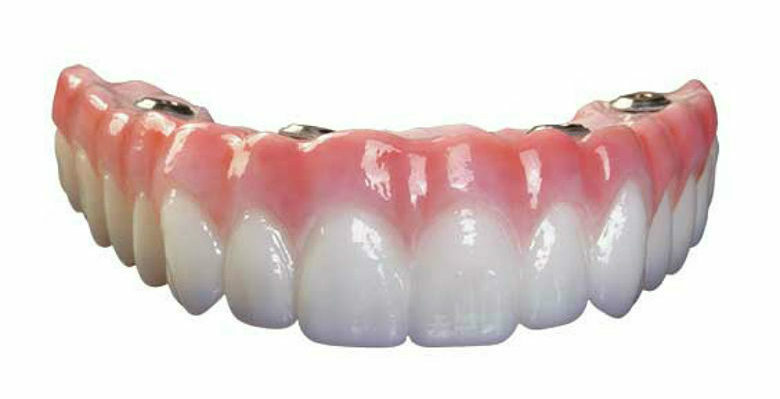 If your dentist creates a temporary overdenture, you may need it to be replaced after a few months. All-on-4 is a one-time, complete teeth restoration process that can be performed in a single day with immediate placement of implants. It is important to follow your dentist’s advise for proper care of your implants in the days following surgery. For the first few hours after the procedure, you have to bite down on gauze packs gently and change it every 30-45 minutes. If you get persistent bleeding, the gauze packs inside your mouth need to be repositioned. Do not touch or rinse the tender areas of your mouth. However, you may experience common post-surgical issues like discomfort, pain, swelling, nausea, discoloration or bruising near the surgical sites, sore throat, dry lips, etc., which usually subsidize within 2-3 days. For counteracting the feeling of muscle stiffness, you can stretch your jaw slowly and gently every once in a while. You can keep your implants clean by brushing and flossing them once a day just like your normal teeth. It takes around 6 months for the implants to get fused to the natural bone and the gums to get healed fully. But you can return to your normal schedule in as less as a week. Till then, take enough rest to promote healing and do not indulge in heavy exercise during this period. Stay on a restricted diet (very soft foods,) until you become able to chew properly. Also, avoid strenuous activities, lifting heavy objects, smoking, etc. Some of the most common risks associated with All-on-4 dental implants include infection, profuse bleeding, failed osseointegration, failed implants, bulky feeling in the mouth, issues with speaking or spitting, etc. If everything goes fine, the All-on-4 implants can last longer than 10 years. Just make sure that you take good care of your ‘new teeth’ according to your dentist’s instructions. The cost of extracting remaining teeth and placing 4 implants in one jaw can range from $12,000 to 15,000. For both jaws, it can reach up to $40,000. Standard acrylic implants cost between $20,000 and $30,000 per jaw while porcelain ones cost between $25,000 and $35,000.